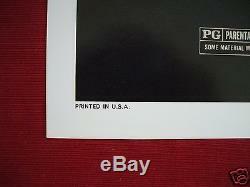 A GENUINE 1983 FOLDED ORIGINAL AUTHENTIC STYLE B U. 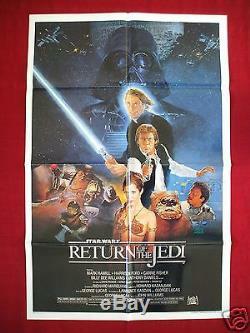 MOVIE POSTER FOR STAR WARS RETURN OF THE JEDI. RARE AND ICONIC STAR WARS IMAGE. THIS IS AN AUTHENTIC U. MOVIE THEATER POSTER ISSUED BY 20TH CENTURY FOX IN 1983! 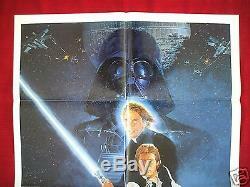 IT MEASURES 27x41 INCHES AND IS IN C9 NEAR MINT - UNUSED AND WELL PRESERVED CONDITION - A VERY HARD TO FIND ORIGINAL. PLEASE REVIEW ALL PICTURES - HAND SELECTED , THE FINEST EXAMPLES - INVESTMENT GRADE. UNUSED AND VERY WELL PRESERVED. READY FOR YOUR HOME THEATER DISPLAY. 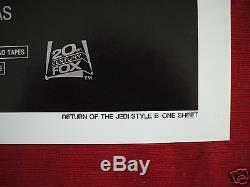 A TRULY BEAUTIFUL EXAMPLE OF THIS HARD TO FIND GENUINE 1983 ROTJ ORIGINAL. WE ARE ABSOLUTELY CERTAIN IT IS AUTHENTIC. BE ASSURED THAT ITEMS WILL BE PROPERLY PACKAGED WITH EXTREME CARE. FULLY INSURED SECURE SAFE PACKAGING. SHUTTERISLAND ORIGINAL VINTAGE MOVIE POSTERS. 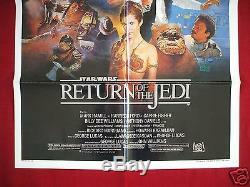 The item "RETURN OF THE JEDI 1983 ORIGINAL MOVIE POSTER 1SH STYLE B FOLDED STAR WARS NM" is in sale since Thursday, April 23, 2015. This item can be shipped to United States, Canada, United Kingdom, Denmark, Romania, Slovakia, Bulgaria, Czech republic, Finland, Hungary, Latvia, Lithuania, Malta, Estonia, Australia, Greece, Portugal, Cyprus, Slovenia, Japan, China, Sweden, South Korea, Indonesia, Taiwan, South africa, Thailand, Belgium, France, Hong Kong, Ireland, Netherlands, Poland, Spain, Italy, Germany, Austria, Israel, Mexico, New Zealand, Philippines, Singapore, Switzerland, Norway, Saudi arabia, United arab emirates, Qatar, Kuwait, Bahrain, Croatia, Malaysia, Brazil, Chile, Colombia, Costa rica, Panama, Trinidad and tobago, Guatemala, Honduras, Jamaica, Bahamas, Viet nam.